Thoughts: Rare, rare, rare. Did the real helmets ever have a small "H" like this? My picture isn't accurate, so is this logo accurate? Thoughts: This has a really nice full-size sticker as compared to the helmet below. notice that this "H" is smaller and fits inside the star. Thoughts: A duck-billed helmet that is a different variation of the one below. Thoughts: A duck-billed helmet that is a different variation of the one above. Thoughts: I'm not for sure about the dates on this helmet but the "H"
Thoughts: This might be the best U.S. Cap Company helmet I've ever come across. What makes it different is that it actually has an outline around the "H" logo as opposed to the helmet above. Thoughts: This was a retro helmet that was put out in 2003. Thoughts: I like to think about seeing Glenn Davis in this helmet. Remember him? When did the "H" size change? Thoughts: Time for a changing of the guard in Houston and those guards would be the Killer B's: Biggio and Bagwell. 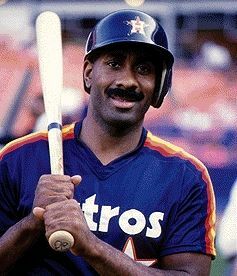 bat for the Astros while wearing this helmet. Thoughts: This is closer to the current Astros helmet that is worn, however, I believe this was designed as a throwback. Thoughts: I don't know if this helmet has ever been used. I know the Astros have an alternate uniform with this cap, but I don't know about the helmet. Thoughts: A celebration of the Silver Anniversary of the Houston Astros.